Since 2012, Stratum Logics has been a trusted and reliable partner providing advanced civil engineering designs and EPCM solutions for private businesses, municipalities, organizations and corporations around the world. We are a solution provider serving a wide range of industries, including oil and gas, mining, energy, railways, and civil engineering infrastructure construction. Stratum has provided hundreds of engineering designs, which have been successfully implemented in numerous projects in all types of soils and climates. Our structural designs feature geosynthetic reinforcement in order to provide long lasting, low maintenance roads and worksite pads. MEG Energy, a major upstream oil and gas company, tested Stratum Logics with the construction of a 3.5km x 8.0m access road. The client knew that the conventional construction methods used by the oil and gas industry would fail because the ground was virtually entirely muskeg with a CBR= < 1.0. As the EPCM firm in charge of the turn-key project, Stratum Logics had to design and build the road as cost effectively as possible. Stratum Logics knew they could mitigate the need to import costly aggregates by applying advanced geosynthetics. In fact, adoption of the NPA geocell technology allowed Stratum to beat all the challenges set by MEG Energy. In the end, the unpaved access road was built in just 40 days using sand in the subbase and base layers and a thin layer of aggregate for the wearing course. Stratum Logics’ know-how and experience in designing load-bearing structures in extreme environments were called upon to design Barsi Enterprises’ rail yard project. 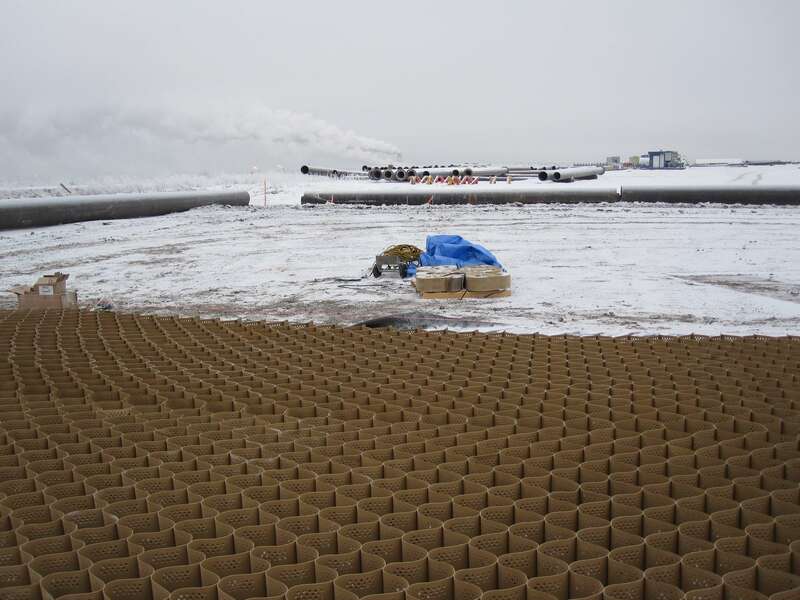 Advanced geosynthetics; NPA geocells were employed to stablize the ground for the new Mammoet heavy-lift crane at the CN Rail yard in Egremont. “This is the third year since our NPA Geocell installation was completed in our log deck and yard storage areas. These are high traffic areas that tend to drive the winter frost very deep. The system continues to maintain its integrity during spring thaw allowing continued usage and access to all inventories with no disruptions to our production process. We are extremely pleased with its performance and cost savings”. For many years the Canfor’s Fort St. John mill battled extreme muddy and contaminated soil conditions. As a result, 988 Cat mobile loaders were unable to transfer logs to the mill during spring and fall seasons resulting in disruptions to lumber production. Stratum engineered, designed and supervised construction of a turn-key soil reinforcement solution for Canfor's log yard storage and transfer areas. The multi-million dollar project eliminated all downtime related to soil conditions affecting log supply; improving mill production, employee morale, safety and reducing mobile equipment operating costs. Estimated cost savings exceed $1.0M/year. "During summer 2015, I visited the Canfor Mill in Fort Saint-John, BC, to gain an understanding of the mechanical behavior of the NPA (Neoloy) geocell reinforced structures. Under the supervision of Wayne Hotte, yard supervisor for Canfor, I met with Mark Stuckey of Stratum Logics (Engineering Design and Construction Supervision) and Derek Breault Paradox Access Solutions, (Installation Contractor) to identify the drainage systems, choice of materials, layer thicknesses for the structures, NPA geocell design and installation process. This visit was very successful as the perforated NPA geocell is a very interesting product for many road engineering practices, specifically in areas where access to decent construction materials and/or weak subgrades can be a challenge. The sub structure bearing capacity seemed to have increased tremendously and the drainage systems seemed to be working quite well." *FPInnovations is a Canadian non-profit member organization which carries out scientific research and technology transfer for the Canadian forest industry.